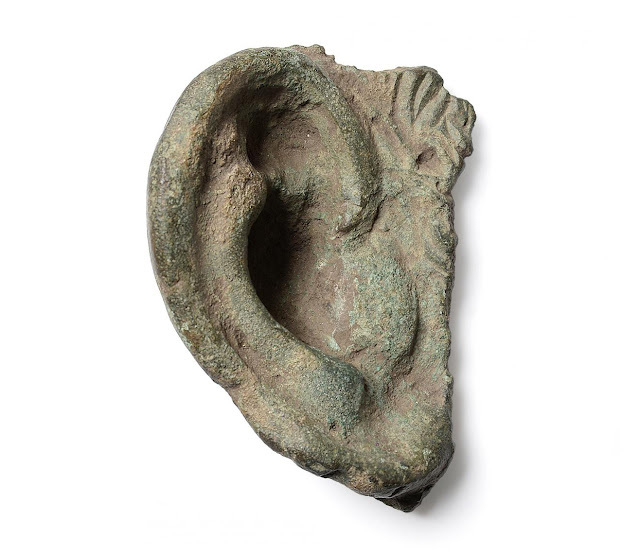 A three inches (eight centimeters) long ear from a life-size bronze Roman statue has been unearthed by a metal detectorist in the village of Brompton-on-Swale, close to a Roman fort and settlement Cataractonium, today is known as Catterick, North Yorkshire and was confirmed to date back to 200AD (1800 years old). Experts believe it broke off during transport and was never recovered to be refitted. It is one of the oldest relics of its kind ever found in Britain, incredibly rare, very detailed and of high-level craftsmanship. The find was made near Dere street, which is a road built by the ancient Romans, the A1 runs alongside it today. The Roman relic was documented with a recorder of archaeological objects found by members of the public named the Portable Antiquities Scheme. It was sold for £1100 on auction.